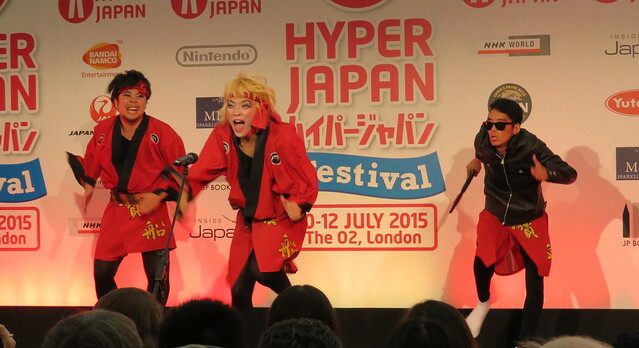 10th – 12th July 2015 saw the HYPER JAPAN Festival, dubbed ‘the UK’s biggest J-culture event’ come to the O2 in London. Having previously been held at venues such as Olympia and Earls Court, the O2 was a new home for this ever-popular event. I went along on the Saturday and Sunday to get my fill of Japanese culture (and food! ), and here are some of my highlights. Actually, I’m going to start with a lowlight. 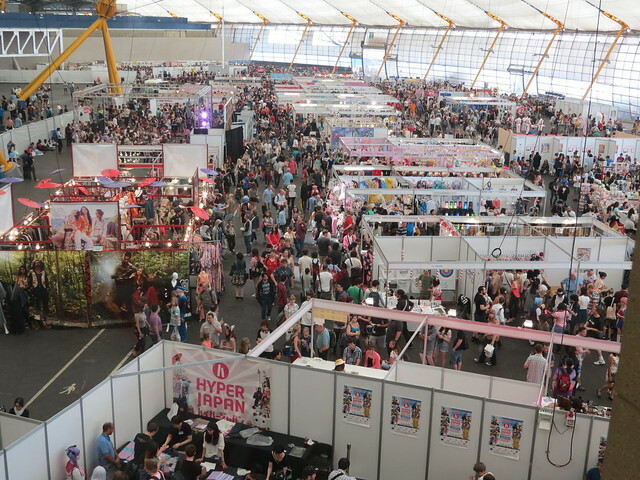 I think it’s fair to say that the majority of people visiting HYPER JAPAN Festival who had been to a HYPER JAPAN event before were disappointed with the venue. On the surface, the idea of being at the O2 was exciting. It’s such a big venue! But that was the problem. It was such a big venue, and the event was spread out all over the place. ‘Area 2′ was the main space housing all of the stalls and the festival stage (which was tiny! ), the food was separated off, and then the games were all in a completely different area (Area 1). Building Six – a completely separate building – was home to most of the music. This all meant that there wasn’t the same loud, buzzy vibe that HYPER JAPAN normally has, and it also meant you didn’t get to discover as much by just passing by something that was happening. Not helping the atmosphere were the rude staff at the O2. HYPER JAPAN is such a fun event usually, and it’s a place where people can be themselves and embrace Japanese culture, but there were reports of staff mocking cosplayers’ outfits, and I can report that some of the security staff were very rude to me when I simply asked for directions. So, the venue didn’t score highly, but let’s move on to the rest of the event. For me, one of the highlights is always the food! It felt like there was a little less food available this time, and it was as expensive as always, but I still found some great stuff to satisfy my belly. 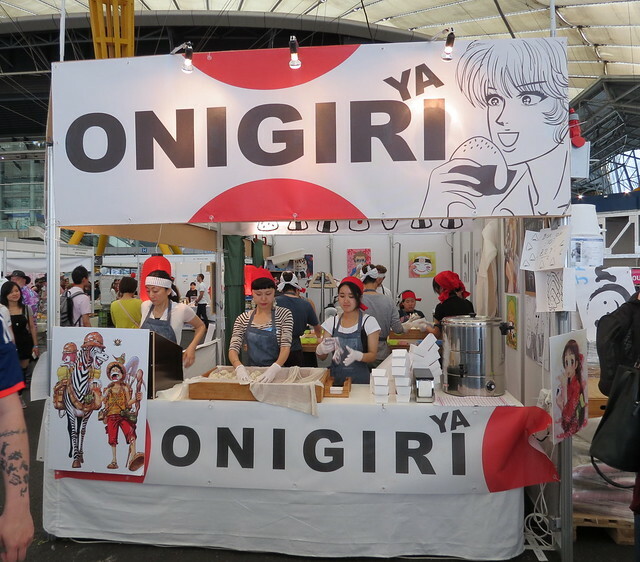 Despite the extortionate price of £3.80 (￥700) for one onigiri, I do think ONIGIRI-YA was a great addition to the HYPER JAPAN regulars, such as OKAN, Yaki and NICE ICE. Onigiri-ya – expensive, but tasty! Along with fashion comes cosplay – the art of dressing up as characters from manga, anime, games and movies. I love looking at cosplay even though I don’t know most of the characters. It’s just so impressive to see the effort people go to. 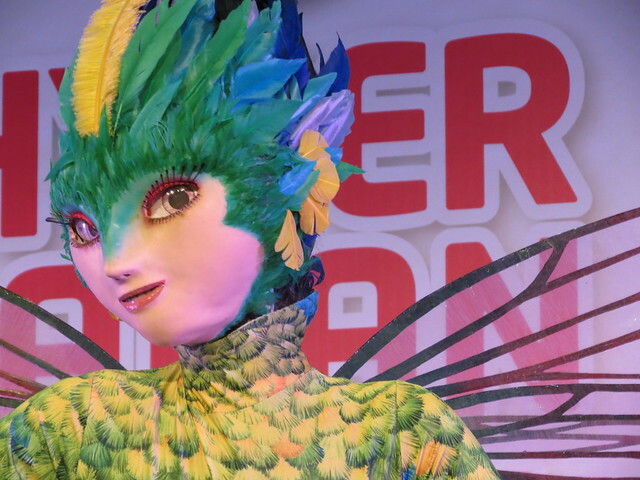 Most costumes are handmade originals, and some I saw at HYPER JAPAN were just incredible. 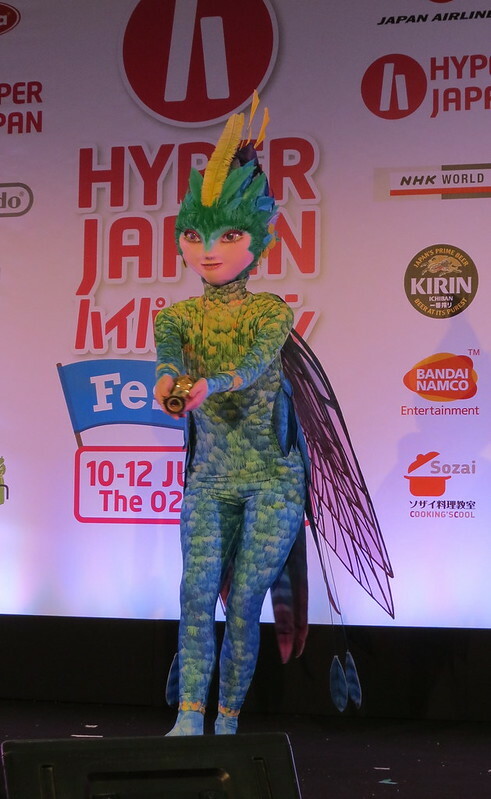 My absolute favourite was this one: Toothiana (the Tooth Fairy) from Rise of the Guardians. Is she looking at me? Yes, she actually is! Eyes that move! Her eyes and wings actually moved, and she had these neat little handheld devices too. It was so well made, and the level of detail was just incredible. 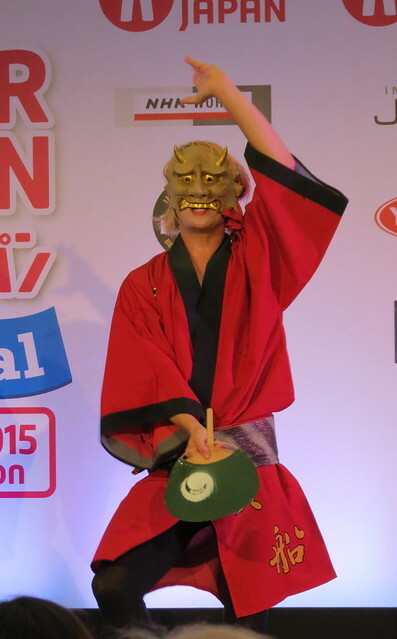 Of course, it wouldn’t be HYPER JAPAN without some J-pop, J-rock and traditional music. I managed to see quite a lot of the acts, including Dempagumi.inc (でんぱ組.inc) (squeaky choreographed J-pop), Heisei Kotohime (平成琴姫) (J-pop/wa-pop featuring unique ‘kotohime’ instruments), Honey Spice (ハニースパイス) (more squeaky J-pop), Yoshiki x Toshi from X-Japan (who will be getting a blog post to themselves! ), Tomoca [友香] Wa-Pop World (wa-pop), Takarabune (寶船 (宝船)) (hilarious dance troupe), VANIRU (weirdly entrancing goth-rock), ONE NOT’E (J-rock), May J (from NHK’s J-MELO, singing Disney-type songs) and the SOAS Min’yo Group. It was an eclectic mix. I discovered that I don’t like squeaky J-pop as much as I thought I did, but I do like gothic J-rock quite a bit. Wa-pop confuses me – sometimes I really like it and other times it hurts my ears. I’m always happy to listen to some authentic traditional Japanese min’yo folk songs though! I didn’t take many videos this time as I had some issues with YouTube and nearly got thrown off the site last year (Sony got a bit heavy handed about copyrights even though I was just posting live performances which I was allowed to film), so here are some more pictures instead! Not pictured above is Takarabune (寶船(宝船)), because I’d like to single them out as one of my favourite acts of the whole event. 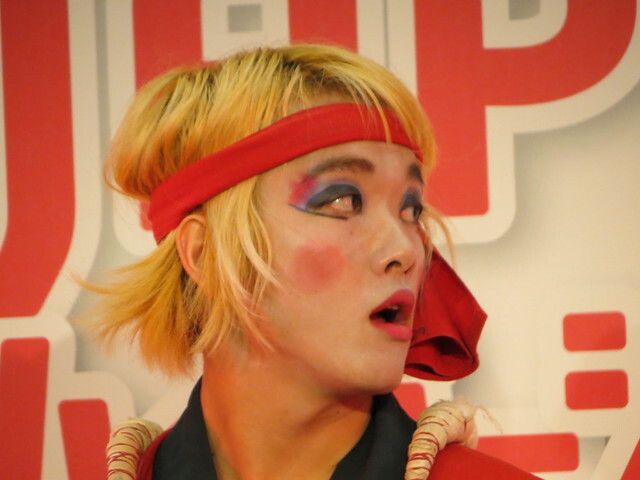 Takarabune are “a creative dance company of Awa Odori”. The Awa Odori (阿波踊り) is a traditional dance from Tokushima (徳島) in Shikoku (四国) and it’s one of the most popular and well-known traditional dances in Japan. The Awa Odori festival takes place in August, but the dance can be seen in Tokushima at a special theatre throughout the year. What Takarabune do is to take the traditional Awa Odori dance and mix it with a bit of humour and performance, and it’s brilliant! They just had soooo much energy! Really fun and entertaining to watch! Takarabune are, hopefully, the next big thing. I don’t know when they will next come back to the UK, but I hope it’s soon! Find out more about them on their official website. So, despite the venue, HYPER JAPAN was still pretty awesome. It was a great chance to get a J-culture fix, meet up with lots of friends I haven’t seen for ages, and discover some new things. 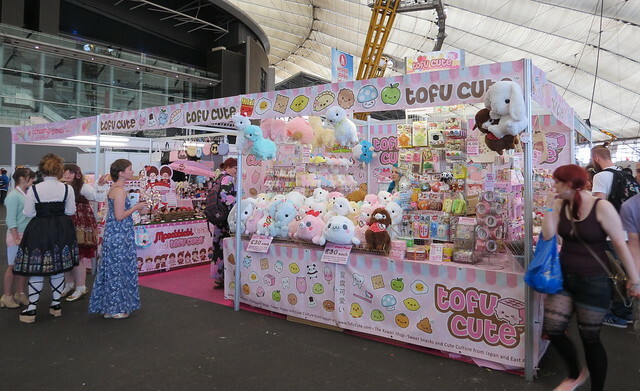 I haven’t really mentioned the stalls – there were lots of them, all selling fantastic kawaii goods, fashion, toys, DVDs, music, crafts, jewellery… everything you can imagine from pastel alpacas to high-heeled shoe-shaped can openers covered in jewels. I tried not to go too crazy this time, but I did make one purchase which will be appearing in a separate blog post soon. I’ll also be putting up one more post to talk about X-Japan, so watch this space! You can always rely on Tofu Cute for all your pastel alpaca needs! Although this is a rather long post, this is only a small sample of what I saw and captured in photos at HYPER JAPAN. If you’d like to see more, please check out my album on Flickr (warning – there are 785 photos!). There are also a handful of videos on YouTube. 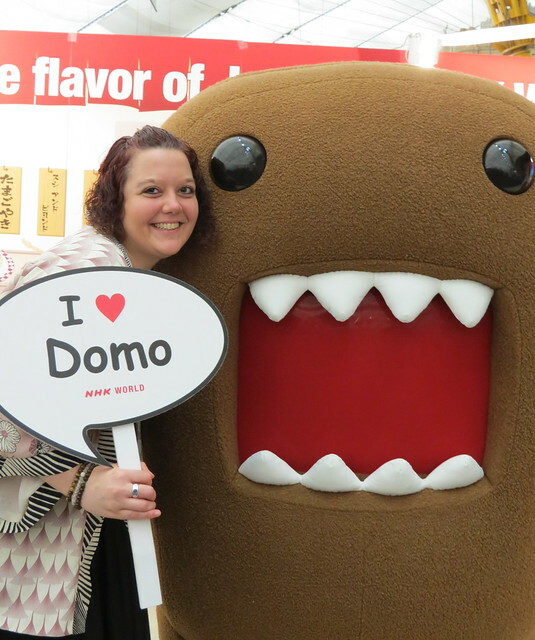 Meeting Domo-kun from NHK – aaaw! So squishy! The next HYPER JAPAN event will be the Christmas Market, which is being held at the Tobacco Dock in London, 27th – 29th November. I won’t actually be there this time because I’LL BE IN JAPAN, but I’m sure it will be a great event! Find out more here. I completely agree with the venue being a bad choice this year. I can’t say for the staff because I didn’t have any interaction with them, but I heard many complaints from other attendees. Yeah, it’s a shame Earls Court closed! I guess as the event gets bigger each year the need for a bigger venue is key, but maybe the O2 isn’t the best place. I spoke to a few cosplayers who felt very uncomfortable sharing the venue with people going to other events in the O2, some of whom made very snide remarks. That said, I did enjoy Hyper Japan but it does need some improvements. The queueing is something that crops up every year and it is pretty shocking they don’t even have a proper feedback form. I had trouble getting in for X Japan too, and one security guy was very rude to me. I found my way in eventually, but it was very badly organised. I agree too that sharing the venue with other people isn’t great – I would have felt uncomfortable if I had been in costume! Great balanced article, thank you! I didn’t attend in July, but am looking forward to going to the one in November.